A Manchester student's final exhibition work has really gone down the pan - with her display in a portable toilet. Art student Melanie Warner has designed what is believed to be the world's smallest art gallery to showcase her collection of pictures of toilet signs. 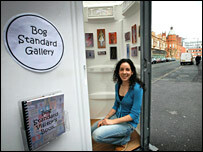 Ms Warner spent six weeks converting from portaloo to 'loovre'- now named The Bog Standard Gallery. The metre-square mobile exhibition space will take to the streets of Manchester in the summer. The 22-year old student at Manchester Metropolitan University said the idea has been in the pipeline for some time. "It all started years ago when an ex-boyfriend bought me earrings which were the male and female toilet signs. Then my mum bought me a bracelet on a similar theme and then I started noticing the different signs everywhere," she said. Ms Warner started taking pictures of lavatory signs wherever she went, from the Vatican to the Middle East. She had amassed a collection of more than 600 photographs and felt it was time that her obsession should have its own very special exhibition space. Ms Warner bought the portaloo from a hire firm in Eccles. "I went to this compound, and there were literally hundreds of them all lined up. I chose this one - it was about 20 years old very battered and really dirty. She said she really had to get her hands dirty to transform the former chemical toilet into a proper mini art gallery. "It was completely disgusting at first. I had to take the toilet out, clean it of course. It took lots of scrubbing and I bleached it I don't know how many times - it was truly horrible." After the art maverick had discarded her marigolds, an oak floor was installed and the walls painted a bright white and a skylight was installed to allow natural light in. She said "It's a proper art gallery now with a wooden floor little blurbs by the pictures and even a fire exit sign - after all you can't forget health and safety." The loo now houses a collection of 24 framed photos. It is on display at the Sha'are Hayim synagogue in Didsbury for a week before visiting venues across Manchester. Ms Warner says after all the hard work she is now flush with success. "The reaction has been brilliant - I think it's the smallest art gallery in the world and everyone wants to get their name in the visitors' book." "People have even started emailing me their own pictures of toilet signs to add to my collection, which is great," she added. But despite her success her project has caused some raised eyebrows among her friends. "When I'm out taking pictures of toilet signs my friends try to disappear as it looks like they're with a weirdo!"